← Mark Drews has great taste, in machines. This is about as clear a starting point as I can remember, when I was coming home from school in the spring of 74 and seeing this poster out the front of the local news agency, advertising the latest Tracks Magazine. That is when I said to myself its time to start surfing, I knew I wanted to for a while but didn’t have the opportunity, or was to shy or nervous or whatever. But seeing Rory Russell on the cover of Tracks on that nice hot Balinese afternoon at Uluwatu, well that spoke to me loud and clear the moment to start is now. Within a month I had myself a wetsuit jacket for my birthday and a Coolite foam board and I was walking to the local beach with a couple of mates to try our luck. For some reason this cover just sticks in my mind, as the moment to stop the wondering and make an action happen, thanks Rory for the motivation. 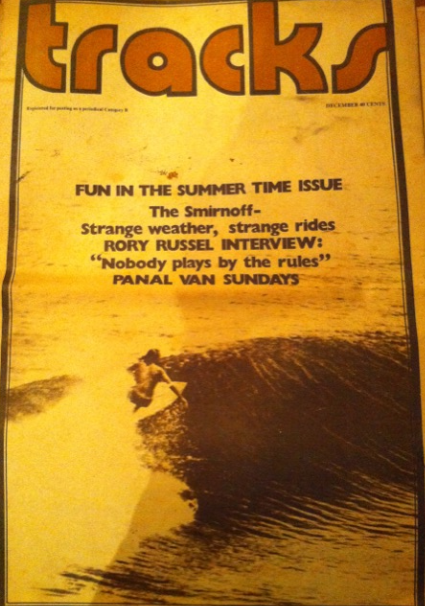 This entry was posted in Beach Culture, Retro, Surfing, Surfing Lifestyle, Sydney Scene and tagged Beginning to surf, Rory Russell surfing Bali, Tracks Magazine 1974, Tracks Magazine 1974. Bookmark the permalink. 1 Response to The starting point. Sometimes all you got are knee high waves. A rare shot of innovator Steve Lis, carving at Lobster lounge. Surfers that drove Valiants, #8 Surf writer Jamie brisick. Classic shot of a favourite break.